The award announced at a ceremony in Dubai, recognizes one exceptional teacher annually who has made an outstanding contribution to their profession. Peter Tabichi who donates 80% of his salary teaches science and math at the Keriko Mixed Day Secondary School in Pwani Village, located in a remote, semi-arid part of Kenya’s Rift Valley. The school is equipped with only one computer, poor internet and a student-teacher ratio of 58:1. Almost all students here are from poor families with many of them orphans or with only one parent and many go without food at home. Life can be tough in a region where drought and famine are frequent and students must walk 7kms along roads that become impassable in the rainy season. 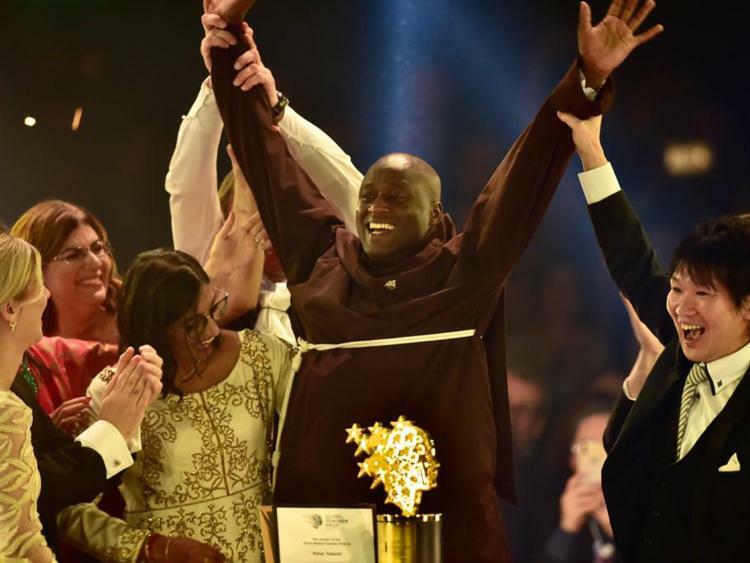 Yet, his dedication, hard work and passionate belief in his student’s talent has led his poorly-resourced school in a remote rural village of Kenya to emerge victorious after taking on the country’s best schools in the national science competitions. According to the Varkey Foundation that organizes the Global Teacher Prize, Peter set up a talent nurturing club at his school and expanded the school’s Science Club, helping students design research projects of such high quality that 60% of his students now qualify for national competitions. Peter mentored his pupils through the Kenya Science and Engineering Fair 2018 – where his students showcased a device they had invented to allow blind and deaf people to measure objects. Peter saw his village school come first nationally in the public schools category. The Mathematical Science team also qualified to participate at the Intel International Science and Engineering Fair 2019 in Arizona, USA, for which they’re currently preparing. His students have also won an award from The Royal Society of Chemistry after harnessing local plant life to generate electricity. “Seeing my learners grow in knowledge, skills, and confidence is my greatest joy in teaching! When they become resilient, creative and productive in the society, I get a lot of satisfaction for I act as their greatest destiny enabler and key that unlocks their potential in the most exciting manner,” – Peter said to the foundation. Despite having just one computer in his school, Peter engages his students through online learning content that he saves when visiting internet cafes to be used offline in his class. He along with four of his colleagues give private tuition to the weaker students and he also visits students’ homes to meet their families to identify any challenges that they are facing. Peter’s students face many challenges, including food shortage, drug abuse, teenage pregnancies, and child marriages. Yet at the Keriko Mixed Day Secondary School where Peter teaches, enrollment has doubled to 400 over the last three years and cases of indiscipline have fallen from 30 per week to just three. In the year 2017, only 16 out of 59 students went on to college, while in the year 2018, 26 students went to universities and colleges. Girls, in particular, have performed exceptionally and are now leading boys in all four tests set in the previous year. 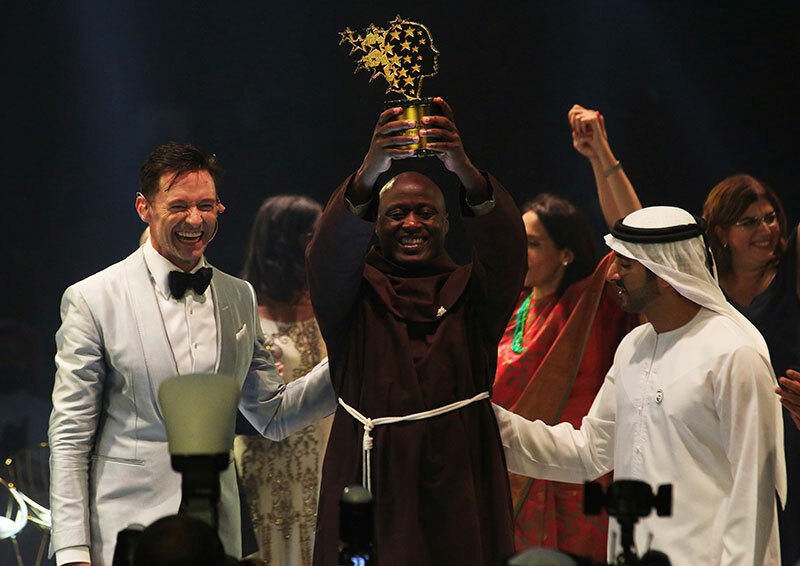 “You have to do more and talk less,” Peter Tabichi said as he accepted the award from actor Hugh Jackman, who hosted the Global Teacher Prize in Dubai, United Arab Emirates.